It's the Little Things. . .: Where has the Summer gone? I can't believe tomorrow is September 1st! Where did August go? Forget August, where did SUMMER go? Temps the last few days have been in the 60s to 70s with lows down to 51 at night. You can almost smell "Fall" in the air. But, that's okay .... Fall is my favorite time of year! Give me a crisp, sunny day with a few light clouds in a beautiful blue sky. . . Leaves turning to those beautiful shades of gold, crimson, and orange. . . Pumpkins laying in the fields ready to be picked. . . But then, around here, Fall doesn't last long enough. It's quickly followed by the dreaded "Minnesota Winter". . . . okay, I'm not ready to go there yet, so let's change the subject. This belongs to Karen D'A. 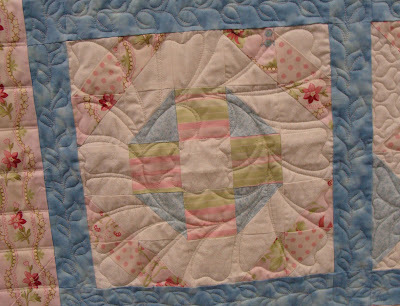 -- this is her first quilt that she made about a year ago. She told me she was planning on using it as a table cloth; but when she picked it up she couldn't believe how it had changed. Her response: "I don't think I can use this as a table cloth now; it's too beautiful!" 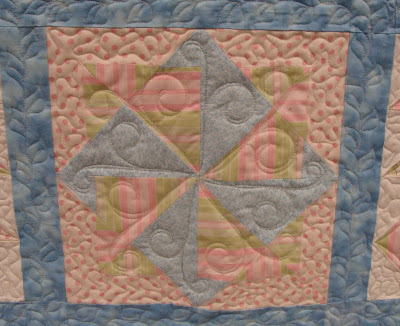 This is one of my favorite blocks from the quilt . . . 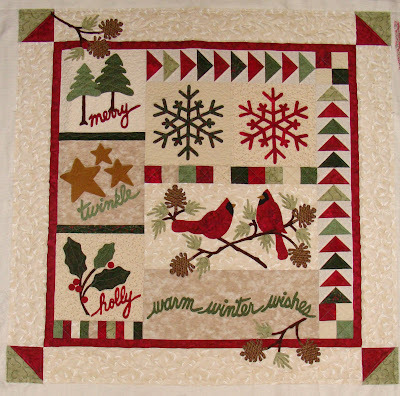 Here's a quilt by Sandy D. This one is a sample for the quilt shop where I work (Fabric Town, Apple Valley, MN). Sandy always does such a beautiful job with applique. This particular quilt was completed with machine applique -- blanket stitch....I was particularly amazed at how she even stitched around the words. I also pulled out an old knitting project this week. I had started knitting a "Booga Bag" (http://www.blacksheepbags.com/booga_bag.html) last winter. I don't have a whole lot left to knit on the bag -- maybe a couple of more inches. Once I get the i-cord strap made, I can go through the felting process. This is one I made last year out of Cascade 220 wool and Nashua Handknits Wooly Stripes. I got distracted while this was felting in the washing machine and it ended up going through an entire 15 minute cycle. I was hoping it would be a little bigger than it is, but it does make a cute little purse. I still want to line it with a light green/cream polka-dot fabric and maybe add a magnetic snap. The worst part of the project --- pounding those stupid grommets . . . I suppose I should end this post. I have the latest issue of Quilt Sampler magazine sitting just a few feet away from me, calling my name to come look through it's pages. A nice cup of tea and I'll be set to go . . . Thanks for stopping by . . .
Oh, the new Quilt Sampler is out? I'm heading to the store tomorrow! Gotta get my copy. Good to have you back posting again. Missed you. Great quilts. Glad to hear bookings are going well. Have a great week. New Quilt Sampler...where's my car keys?!!! Sounds like you're busy...which is a good thing...especially with the economy! Keep us posted...we love to see what you're up to. Ta-Da!!! Here they are . . . It's All About ME. . .
We made it through the weekend . . .